Product Simplification, otherwise known as “Design for Assembly,” is a product development strategy that can substantially reduce total product cost and improve reliability. All of this is possible without compromising a product’s ability to function. To achieve this, products are re-designed to be as easy to assemble as possible. 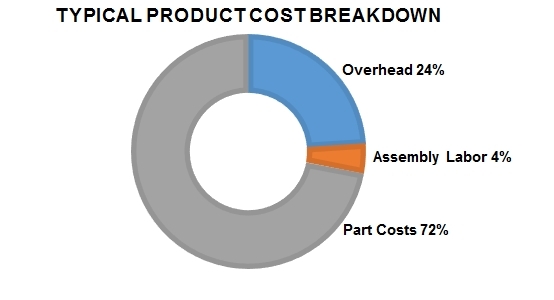 This approach is unique in that most cost reduction strategies only look at reducing the costs of individual parts. Since the 1980s, hundreds of companies have achieved an average product cost savings of 50% with Product Simplification. This ground-breaking methodology has been successfully applied to automobiles, electronics, consumer goods, medical devices, industrial equipment, aerospace, and many other products. Why should I care about assembly labor? The reality is that this strategy can actually lead to a higher total product cost relative to a strategy that focuses on minimizing assembly labor. How could this be? The answer lies in the fact that designing parts to be easy to manufacture tends to increase the total number of parts, while designing a product to be easy to assemble usually reduces the number of parts. 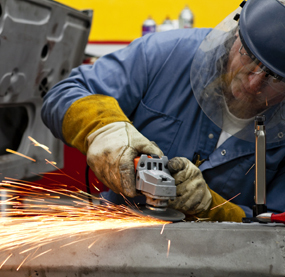 Industry research has shown that thanks to modern manufacturing techniques, using fewer parts will frequently be less expensive than using a large number of inexpensive parts. The added advantages of a reduced part count are that the product becomes easier to service, usually has fewer defects to begin with, and is typically more reliable throughout its lifetime. Ultimately, Product Simplification ensures that more value is captured by both the manufacturer and the consumer. How do I execute this strategy? In theory, it seems easy enough for a good designer to simply avoid adding extra parts. Yet in practice, many finished designs are very inefficient because the product development team either didn’t have enough time or didn’t recognize which parts should be combined together. This is where the early use of DFMA software becomes critical. The DFA software component quantifies assembly efficiency and provides suggestions for re-design that in many cases also improve the product’s performance. Additionally, the theoretical minimum number of parts is calculated to help the user understand what the total potential for part consolidation might be. Once DFA re-designs are proposed, the should-cost of each iteration can quickly be compared with the DFM software component. By combining the use of DFA and DFM software a development team can capture the full benefits of Product Simplification. Product Costing is a product development strategy that allows companies to anticipate and influence manufacturing costs during the earliest stages of product development. Since it is widely accepted that over 70% of product cost is locked-in during the design phase, it is extremely important that designers and manufacturers collaborate to ensure total product cost goals will be met. The problem is that the typical product development team operates in a “toss it over the wall” fashion. That is to say that the design team is sitting on one side of a wall and the manufacturing team on the other. Once the design is finished, it gets tossed to the manufacturing team in a manner that doesn’t allow for any collaboration. A first-class product development team will instead implement Product Costing to avoid lengthy re-design efforts and missed cost reduction opportunities that result from the more typical approach. What does an effective Product Costing process look like? The first stage of Product Costing is where the design engineers provide specifications for the parts they have decided to include in the product structure. Ideally, a Product Simplification strategy will have been used to help achieve this. Using these part design specifications, the manufacturing engineers can provide feedback as to what is actually involved in bringing the designs to life. This combination of design and manufacturing information allows for accurate cost estimates to be generated in DFM Concurrent Costing software. At this point, the designers go back to their initial proposals and finalize the selection of processes and materials, as well as fine tune the parameters of each design. The goal is to achieve the lowest cost design for each finalized part that is still able to meet the functional requirements of the product. 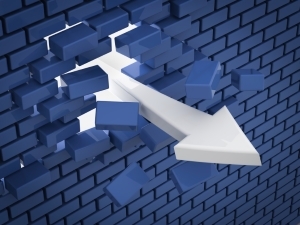 What benefits does DFM Concurrent Costing provide during this process? Besides providing real-time accurate cost estimates, DFM Concurrent Costing serves as the focal point of communication between designers and manufacturers. DFM identifies the major cost drivers for each manufacturing process so that both manufacturing and design can ask the essential cost related questions at the most relevant time. This results in a faster product development process because there are fewer problems to address during the latter stages of development. With Product Costing, product development becomes a more focused and educated effort than previously. Supplier Costing is a cost management strategy for reducing the price paid for a part. Quite frequently, management will establish cost reduction goals and demand sufficient price reductions from the supplier. These arbitrary price reductions can leave profit on the table because they are not based on a thorough understanding of the true manufacturing costs involved. They can also weaken the supply chain and risk putting price competitive suppliers out of business. A much more fruitful approach is to compare supplier price quotes against an independent estimate of the true manufacturing cost. The discussions that take place after this comparison is made should have the objective of understanding any differences. A frequent mistake that many organizations make when trying to generate their own cost estimates is that they rely at least partially on historical price information. The problem with historical pricing is that it usually doesn’t accurately portray the cost to the supplier of making new parts. A lack of accuracy causes you to misdirect your negotiation efforts towards areas where little realistic opportunity for savings may exist. Additionally, you will fail to highlight hidden opportunities where the supplier is charging you far more than what the part actually costs to make. Any reliance on price information needs to be removed from your analysis, so that the only variable you are truly negotiating is profit. DFM Concurrent Costing is an ideal tool for negotiating with suppliers because it allows you to generate accurate cost estimates in real-time. By focusing on only the factors that truly drive cost, an organization can quickly understand whether a supplier quote is reasonable. The responses provided by the software are in a language that suppliers easily recognize, so there is no dispute as to how the estimates were generated. This allows for a fair and transparent Supplier Costing process to occur and a truly sustainable supply-chain to be developed.